Formed in Los Angeles in 1994, the core of Ritual is Mike Day on lead vocals, Jon Tompkins on guitar and vocals and George Radai on bass and vocals. To record their debut album, Nothing Strange, the trio enlisted a number of guests on guitar, drums, horns and vocals. I think what makes Ritual so interesting and often unique is their ability to incorporate what otherwise might be completely unrelated styles and influences into something sensible and cohesive. They excel at creating challenging yet accessible heavy rocking music, often with a power-pop feel, but with a prog rock sense of variety and sophistication. Day's vocal style is difficult to describe. He's not your typical hard rock vocalist, but he's definitely an expressive singer and his style helps to give much of the off-beat character to Ritual's sound. Among the highlights is "Mirrors", which opens with some ultra cosmic bubbling space efx. It then sounds like the song is going dispense with the freakiness, but no... there's lots of tasty psych guitar throughout, which sounds very nicely and uniquely strange combined with Day's vocals. A very cool heavy psych-rock tune. "Second Thought" is another standout track and one that covers a lot of ground, from pleasant flowing pop, to thrash and heavy psych-rock. It sounds all over the place just reading the description but Ritual successfully put all the varied pieces into place. "Ava G" continues down this path, incorporating jazz, pop, Spanish guitar, and prog rock influences. A nice trippy psychedelic edge is injected into "Blues For Scheherezade" and "Sarcasm". I really dig the hard rock guitars, which get mightily soulful on "Little Gods & Bastards". The music is recorded with a very full sound and the horn section is a nice touch. And "The Pop Song" and "Yesterdayhead" both demonstrate Ritual's ability to lay down a head bopping, but still hard rocking, groove. After several listens I'm amazed at how these guys manage to keep the songs so accessible when there's so much going on musically. Great songs and playing. 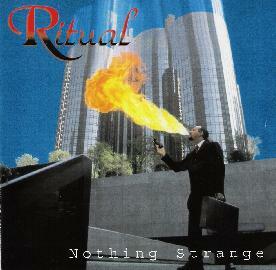 And given that this CD is from 2002, hopefully Ritual have something new in the works. For more information you can visit the Ritual web site at: http://www.nothingstrange.com. Contact via snail mail c/o Ritual; PO Box 972; Hermosa Beach, CA 90254.